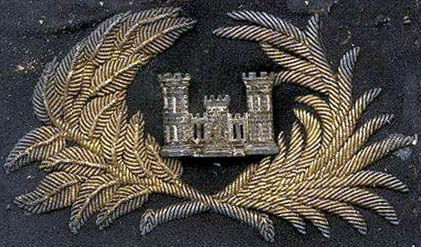 The Corps of Engineers wore a castle in a wreath on the front of either the Jeff Davis (Hardee) hat or forage cap (kepi). 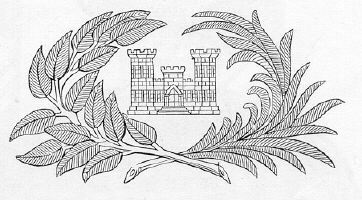 Unlike other wreaths, the engineer's insignia was formed from two types of leaves. On the left side of the insignia is palm and the right laurel. The silver castle could be embroidered or of metal. The design of a castle in a wreath was first used in 1840 and continued in use through the Civil War until 1895 when separate branch insignia were replaced by a national emblem, the seal of the United States, on officers' hats.